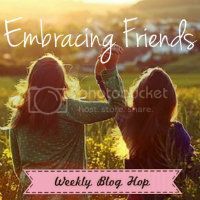 Welcome to the Embracing Friends Weekly Blog Hop! 1. Follow me, the host and this week's feature (be sure to stop by and let her know that you're following from the Embracing Friends blog hop)! 2. Link up your main blog page, not a specific tutorial. 3. Click around, visit others and follow along. This is here to make new friends and connections. 4. If you want, post about it on your blog! You can grab the code here. Today's Feature from last week's blog hop: Domestic Deficit Disorder. Hi everyone, my name is Tanyia! I am so excited to be featured this week, thank you Kelsey so much for the 15 minutes of fame! I will love every second of it! I am 37 and a stay at home mom of three girls. They are 19, 14, and 11. As my girls are older now I have more time for crafting, recipes, blogging, pinterest and my other 101 interests! My blog is titled Domestic Deficit Disorder. I kind of have crafting ADHD and definitely not much of an attention span for traditional domestic duties like cleaning! Meh! I would much rather be quilting or scrapbooking! hehe. I have been blogging for a few years now and am getting SO close to my 500th post! I love to blog about all the different stuff I do that helps keep me too busy to do the dishes! Come and see me anytime! PLEASE stop by and visit her and check out what she's got going on. Next week, I'll pick a new blog from this week to feature. So now, it's time to link up. Have fun, and I look forward to getting to know so many of you! Thanks for hosting...popping over to visit your featured blogger! Found you thru the Followers to Friends blog hop! Happy New Follower!